This letter was written by CAMP 420’s Director and longtime AZ Marijuana Activist, Rain Baker. Rain sent this unprompted letter directly to the Arizona Medical Marijuana Dispensary owners who are supporting MPP’s Campaign to Regulate Marijuana Like Alcohol. It’s widely known that CAMP 420 has supported the AZFMR Initiative from the very beginning, and Rain has personally collected THOUSANDS of signatures for the AZFMR Initiative in addition to contributing to the Campaign in numerous other ways. Thank You to Rain Baker and CAMP 420 for taking the time to write such a heartfelt letter! I am one of those cannabis activist types that think no one should go to jail for a plant. I am writing you today to ask a favor with an issue you may or may not be aware. I have witnessed a deep rift in Arizona’s cannabis community. The marijuana reform initiative many of you and your associates support, the Marijuana Policy Project’s (MPP) Campaign to Regulate Marijuana Like Alcohol reads as a clear and blatant attempt to monopolize the Arizona marijuana industry to myself and many, many others. This initiative you’re supporting will maintain marijuana prohibition in Arizona and THAT is just wrong for our community. Our community deserves a thriving marijuana industry as well as deserving of marijuana decriminalization. Maintaining Arizona’s strict felony charges for marijuana possession is NOT legalization and that is exactly what Regulate like Alcohol is proposing. Setting up an oligarchy for a few, Arizona dispensary owners and investors is setting Arizona up for failure! Ohio voters REJECTED “legalization”, because they didn’t want the monopoly styled legislation. Arizonans will do the same thing! We have to realize that getting on the ballot is only the first hurdle. We still have a segment of our Arizona population who have not been swayed that legalization is a better alternative. We need to educate those people who are oblivious of the harm of the drug war to non-violent people. We should be educating together about treating addictions compassionately versus incarceration as well as other important issues. The favor I want to ask of you is to lend your support to an initiative that ALL of Arizona can stand behind. The Campaign to Legalize and Regulate Marijuana in Arizona is the better option for all of Arizona. The Arizonans for Mindful Regulation #AZFMR campaign addresses not only decriminalization, but post conviction relief, as well as keeping our medical marijuana program intact. Dispensaries will still do very well as businesses do when there is healthy competition. More importantly, we will have made a move toward righting the social injustice that is marijuana prohibition, and that is the overall goal of changing these laws. Don’t you agree? Again I beg you to please offer your support to the real citizen’s initiative. 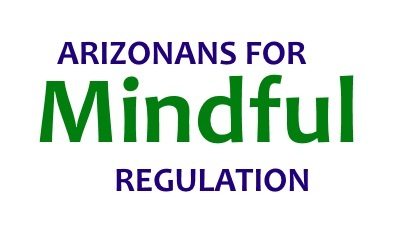 #AZFMR Arizonans for Mindful Regulation, the Campaign to Legalize and Regulate Marijuana in Arizona. It is the right and the better choice for All of Arizona. Rain Baker, An Arizona Cannabis Activist who cares. How exactly does the MPP “blatantly attempt to monopolize”? MPP’s 2016 Initiative says that ONLY the EXISTING Arizona Medical Marijuana Dispensaries are guaranteed to receive any of the new Recreational Marijuana business licenses! HOWEVER, MPP’s Initiative allows our Cities and Counties to limit the amount of each type of Marijuana business that will exist in their jurisdiction, EXCEPT that the City or County may not limit the amount of Recreational Marijuana businesses that are owned by the existing MEDICAL MARIJUANA DISPENSARY OWNERS. Based on how Cities and Counties enacted their Ordinances for our Medical Marijuana Program, we KNOW that most every single City Council across the State of Arizona HATES Marijuana. In fact, it’s being well documented in the Media that our existing Medical Marijuana Dispensaries are STILL having to battle with numerous City Councils in order to expand their State-Licensed Medical Marijuana grow operations. Point is, if given the choice, we firmly believe that the vast majority of City Councils will choose to say that ONLY the EXISTING Medical Marijuana Dispensaries can receive any of the Recreational Marijuana business licenses. Sadly, MPP’s Initiative gives Cities and Counties that choice. Allowing 6 City Council-members to control the Marijuana License distribution is scary for anyone who wants to open a Marijuana business in Arizona. MPP’s “Campaign to Regulate Marijuana Like Alcohol” is being paid for by a wealthy group of 30 Arizona Medical Marijuana Dispensary Owners. That’s why the MPP’s Initiative was specifically written to give the existing Arizona Medical Marijuana Dispensaries the “Oligopoly” on the Arizona Marijuana Market.